This Sunday, April 2nd, I organize a snowshoe hike in Chamonix. Distances from Geneva 80 km. Departure from Col des Montets (1,461 m). 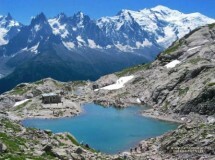 You take the path on the Grand Balcon south and which dominates the Chésery lakes. Panorama superb on the massif of Mont Blanc. Then the chalet hotel du Lac Blanc (2,352 m). A gradient of 900 m and a distance of 12 km. Walking time: about 5 hours. Price 5 Euros including insurance. Transport: passenger pays 16 Euros to the driver.